Don't forget! Join us tomorrow as we study 1 Peter and hear Pastor Marty Burgess teach on grace for temptation. Come at 6 PM for coffee and snacks, then 6:30 for worship! 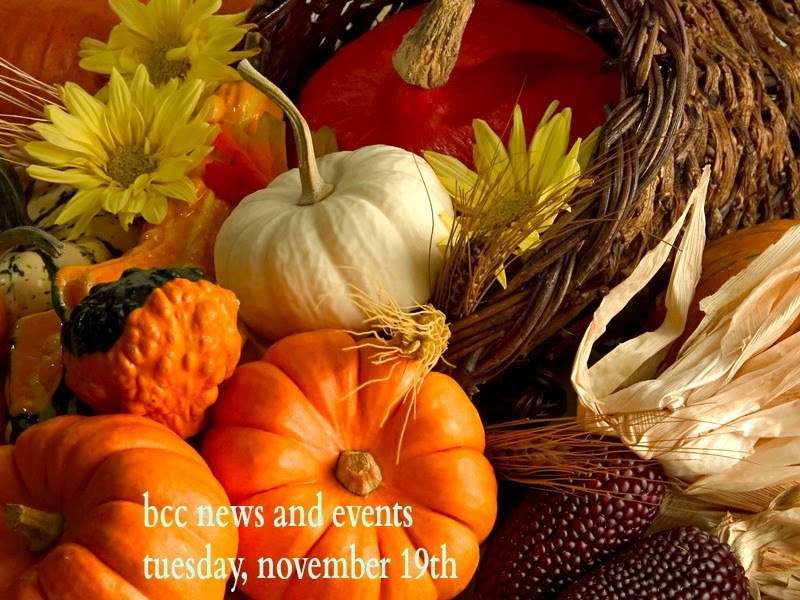 Thanksgiving Communion Coming Up Next Tuesday, November 26th! Join us as we celebrate communion on a special date, next Tuesday November 26th at 6:30 PM. We take communion to remind us of the sacrifice Christ paid for us on the cross! Let us join together in this season of Thanksgiving to remember the depths of God's unconditional love for His people! December 1st is a special Sunday! Tis the season to give! All tithes given the first Sunday of December will fund both local and foreign missions and the Lottie Moon Christmas Offering. Also, join us as we welcome our new Worship Pastor Brett Best and his wife Trista to our BCC Family. Community Christmas Dinner Wednesday, December 11th! Our annual Christmas Dinner is coming up December 11th at 6 PM. We will provide the meat but, we ask that you bring a couple large side items. We are inviting our neighbors in the community so we need to make sure we have enough food. Ladies Christmas Tea Coming Up Saturday, December 14th! Ladies, you are invited to a Christmas Tea and Ornament Exchange on December 14th from 9 to 11:30 AM. Join us for hot tea, refreshments, door prizes, music, and fellowship. Purchase your tickets in the back of the worship center this Sunday. KidZone Needs A Handyman For A Couple Of Months! Do you consider yourself a handyman? The Kidzone Department needs your expertise. We need help with repair, installation, and electrical work. Contact Chris at 828-553-7583 for details.